 These days, a lot of medications are frequently changing into their generic counterparts. To assist pharmacists with the added costs of this trend, Yuyama has developed a special canister that can caribrate itself to count various drugs, making concerns about drug changes a thing of the past. 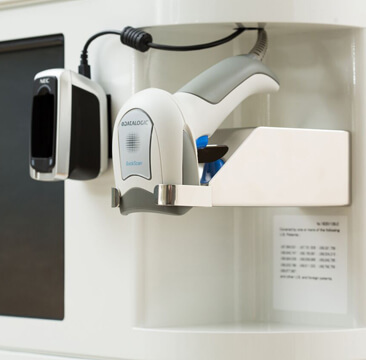 The user can operate and check prescriptions easily from the touchscreen. 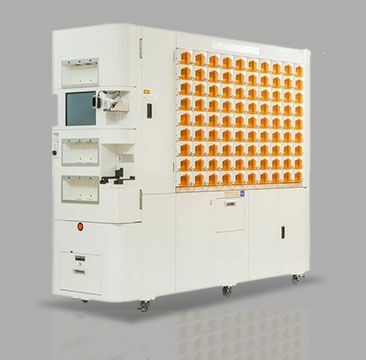 Every time the user wants to see the history of the dispensed drugs,_patient names, Rx No, Drug code and so on, this device will not only display this information the window, but also output data via CSV file or printout. 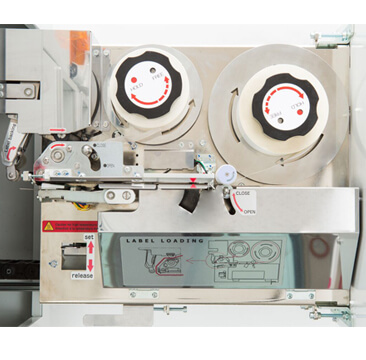 This unit enables canisters to automatically self-calibrate based on the information taken from the Imaging Station, ensuring that there is no possibility of incorrect calibration due to manual/human error. The Drug Imaging Station is where photos of medication are taken and analyzed for the canister to calibrate itself. Our device ensures perfect calibration, completely eliminating the problems caused by manual canister adjustment. 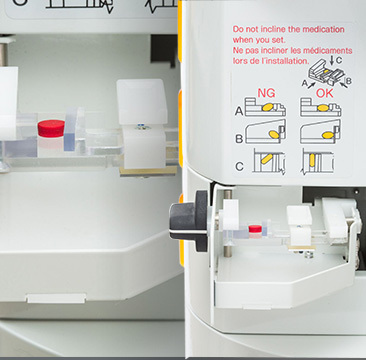 Many modern devices leave their pharmacists scratching their heads due to the complexity of threading new labels or when the label jams. Yuyama has simplified the composition of the printer, designing it so that the user can set labels easily. 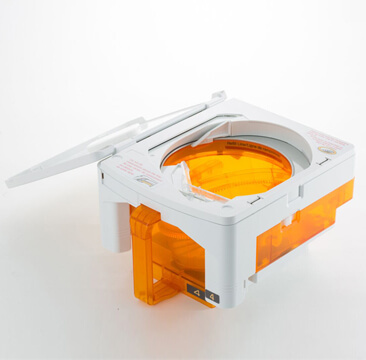 Yuyama makes sure that replenishing the device doesn't get in the way of our customers' business. 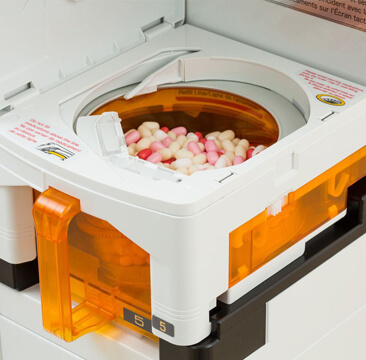 Yuyama uses exclusive technology for its random load vial bins, designed to let you easily pour a box of vials into the machine. 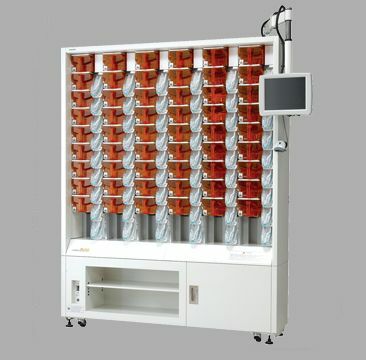 Vials do not need to be loaded individually, and the EV-180UC continues operation while canisters and vial bins are being replenished.